The European Union airs a tone of reconciliation as it tightens proposed restrictions on the Brexit transition. The European Union seems to be jumping at the chance to coax the U.K. into staying in the union after all. "We, here on the continent haven't had a change of heart. Our hearts are still open to you," European Council President Donald Tusk said Tuesday. The U.K. already voted to leave the bloc, but there's been some talk lately about holding a do-over vote. And even prominent anti-EU campaigners, like Nigel Farage, are entertaining the idea. "The percentage that would vote to leave next time would be very much bigger," former UK Independence Party Leader Nigel Farage said Thursday on British public affairs program "The Wright Stuff." The "Leave'"vote won the Brexit referendum by a slim margin in 2016. Farage's statement has some pro-EU groups fired up about the possibility of another vote, but Jeremy Corbyn, leader of the pro-EU Labour Party, says he won't call for another vote. And the EU's encouragement to stay comes as it's further tightening guidelines for the split against the U.K. The EU's latest draft of a Brexit blueprint would require EU "authorization" to keep the U.K. in its current EU trade deals. The U.K. also couldn't reject would-be EU migrants who want to work in the U.K. without first introducing new immigration rules, according to the Financial Times. The union also wants EU citizens to maintain their "freedom of movement" during the transition. 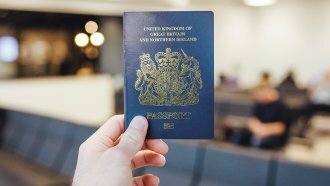 That means EU citizens would be able to travel, live and work in the U.K.
And another key stipulation — the EU is talking about keeping the U.K. subject to its court system during the transition from EU to non-EU member. That's a process that could take a year and a half to two years.